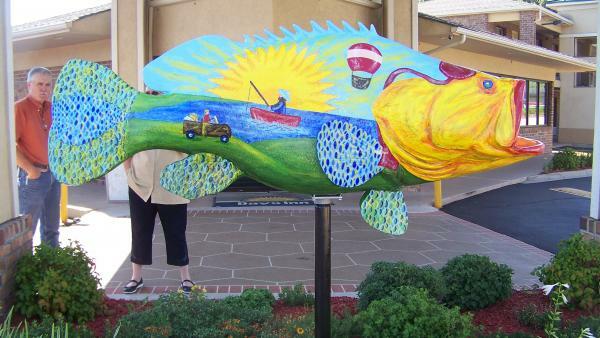 The Days Inn of Weldon wanted to make certain travelers felt welcomed to the hotel and to Halifax County with their vibrant fish painted by artist Jane Deese. The fish is wearing a sleep mask, as he relaxes at the Days Inn. He has beautifully colored scales, and on his sides are scenes from the area – a car packed with suitcases traveling to the lake where a fisherman in a boat is waiting. He also features a brilliant sun, and the symbol for great days at Days Inn.